Hey! I’m a freelance writer and journalist who had a monthly health and fitness column in Gay Times Magazine for three years. I’ve also had pieces in Attitude and MTV Fit. I was frustrated with the male image that was being represented and I wanted to hear a real person’s voice instead of a sponsored fitness model who is paid and kept to have ripped abs! So, I decided to try and be that voice of the real man’s plight and as the ‘Average Joe-Mo’ was born. I explored new and varied ways to stay in shape, that were realistic to people’s timescales and ability. 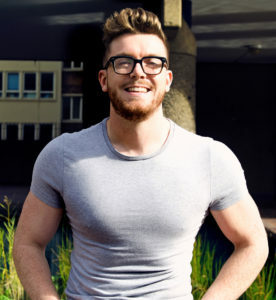 I’ve interviewed a wide range of fitness experts including rugby aces James Haskell and Chris Robshaw, and Chris Pratt’s personal trainer…as well as meeting Chris Pratt. Which was pretty exciting. (Omg it was SO exciting). I’ve previously worked with brands including Reebok, SoShape Smart Meals, The Foundry Gym, Maximuscle and clothing label Ron Dorff. By day, I work in TV production – behind the scenes on sitcoms and other scripted comedy shows – including The IT Crowd, Birds of a Feather, PhoneShop and People Just Do Nothing.